This document outlines simple and easy to follow procedure to convert text to speech. Text to .wav file conversion is also discussed and link for text to speech voices desribes how to find out and use already installed voices on your computer to convert text to speech or to wav file. Open Turn Off Monitor Settings. Click on File - > Text to Speech. In the edit box, enter the text or paste text from clipboard. Now Click on the button labelled Speak. That's it, the voice converted from text will be played on your default voice output in a synchronous way (i.e when the voice is played, you will not be able to cancel the voice playback). In case you wish to hear the speech in another voice, go to control panel & configure another voice. 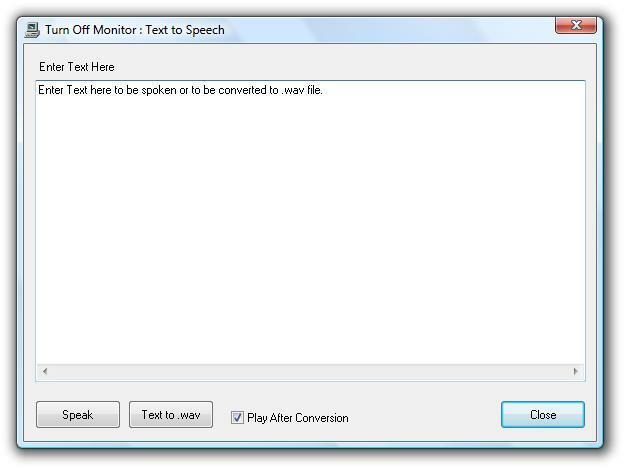 Download Software Now and convert text to speech easily. Now Click on the button labelled Text to .wav. Now select the .wav file path (file name and path for the .wav file to be created). That's it, now the utility will convert text to .wav (using default voice configured in control panel). In case the check box labelled Play After Conversion is checked, the .wav file will be played after conversion from text to .wav. Download Software Now and convert text to .wav now. Alarm Clock, Desktop Clock, World Time, and more software downloads.